To support the development of microscopic driver behavior algorithms, the Next Generation SIMulation (NGSIM) program is collecting detailed, high-quality traffic datasets. NGSIM stakeholder groups identified the collection of real-world vehicle trajectory data as important to understanding and researching microscopic driver behavior. The NGSIM datasets represent the most detailed and accurate field data collected to date for traffic microsimulation research and development. The Interstate 80 (I-80) freeway dataset was the first of several datasets collected under the NGSIM program. Researchers for the NGSIM program collected detailed vehicle trajectory data on eastbound I-80 in the San Francisco Bay area in Emeryville, CA, on April 13, 2005. The study area was approximately 500 meters (1,640 feet) in length and consisted of six freeway lanes, including a high-occupancy vehicle (HOV) lane. An onramp also was located within the study area. 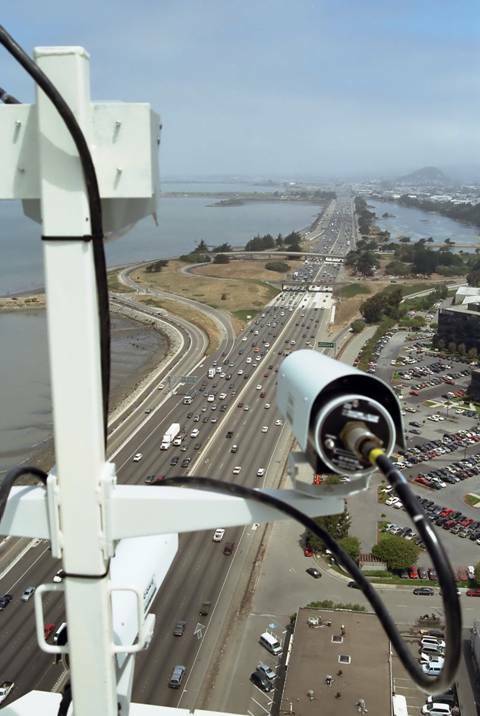 Seven synchronized digital video cameras, mounted from the top of a 30-story building adjacent to the freeway, recorded vehicles passing through the study area. NG-VIDEO, a customized software application developed for the NGSIM program, transcribed the vehicle trajectory data from the video. This vehicle trajectory data provided the precise location of each vehicle within the study area every one-tenth of a second, resulting in detailed lane positions and locations relative to other vehicles. Figure 1. A digital video camera mounted on top of a building that overlooks I-80 is recording vehicle trajectory data. A total of 45 minutes of data are available in the full dataset, segmented into three 15-minute periods: 4:00 p.m. to 4:15 p.m.; 5:00 p.m. to 5:15 p.m.; and 5:15 p.m. to 5:30 p.m. These periods represent the buildup of congestion, or the transition between uncongested and congested conditions, and full congestion during the peak period. In addition to the vehicle trajectory data, the I-80 dataset also contains computer-aided design and geographic information system files, aerial orthorectified photos, freeway loop detector data within and surrounding the study area, raw and processed video, signal timing settings on adjacent arterial roads, traffic sign information and locations, weather data, and aggregate data analysis reports. The full I-80 dataset is freely available at the NGSIM Web site at http://ops.fhwa.dot.gov/trafficanalysistools/ngsim.htm. Figure 2. The aerial photograph on the left shows the extent of the I-80 study area in relation to the building from which the video cameras were mounted and the coverage area for each of the seven video cameras. 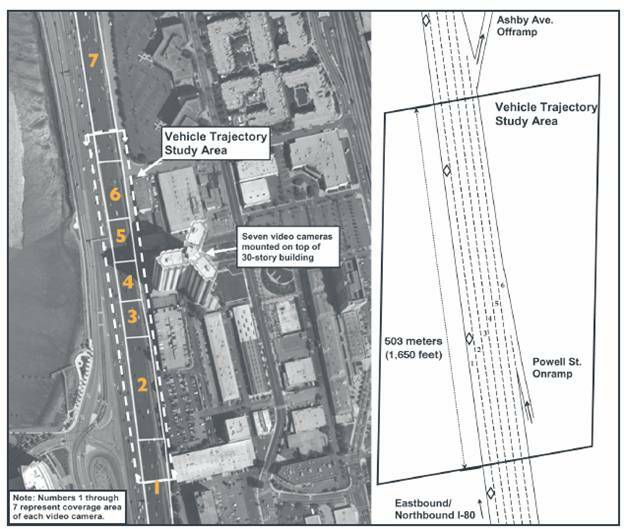 The schematic drawing on the right shows the number of lanes and location of the Powell Street onramp within the I-80 study area. NGSIM researchers used the I-80 dataset to develop and validate the Freeway Lane Selection, Cooperative/Forced Freeway Merge, and Oversaturated Freeway Flow algorithms. The dataset enabled NGSIM researchers to understand the core driver behaviors for these algorithms at a level of detail and accuracy not available previously. These high-quality algorithms can be incorporated into traffic microsimulation models, which will help transportation practitioners make more reliable and valid transportation decisions. In addition to using the I-80 dataset to develop algorithms, many researchers within the broader traffic simulation and engineering community are using the data to examine other topics, such as congested freeway conditions, freeway lane distribution, freeway weaving areas, HOV lane usage, heavy vehicle movements during freeway congestion, and advanced safety applications. In addition, researchers are using the I-80 dataset to validate and calibrate existing algorithms and models.